Energy-efficient LED flush mount ceiling fixture with an opal glass shade and Satin Nickel base is designed to cast light evenly around any living space. Integrated Light Emitting Diodes consume 14 Watts and are distributed evenly, while the opal glass shade diffuses 1,080 lumens of light output. This high-quality, long-lasting, energy efficient LED ceiling light is perfect for kitchens, laundry rooms, closets, garages and basements. The frosted white acrylic lens distributes light evenly, while the brushed nickel trim enhances any decor. The low profile flush mount design can be mounted on a ceiling or wall and its lightweight construction makes installation easy. Dimmable, Energy Star certified and cUL rated, the fixture produces 980 lumens of bright white light (4000k Correlated Color Temperature). 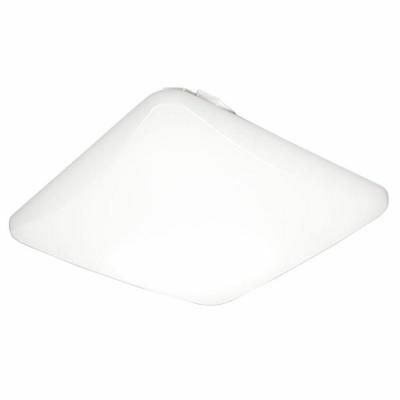 Equivalent to 75 watts of incandescent light, this Hampton Bay 11 LED ceiling light uses only 14 watts of power, saving up to $336 in energy costs over the life of the fixture. Rated to last 45.6 years or for 50,000 hours of continuous use, so there are no bulbs to replace! 14 Inch LED Low Profile Square - ENERGY STAR® is rated 4.6 out of 5 by 145. Rated 5 out of 5 by jww from Beautiful bright light. Really lit up my kitchen work area. Beautiful bright light. Really lit up my kitchen work area. yes it is dimmable. Please check to see if your dimmer is compatable for LED lights.